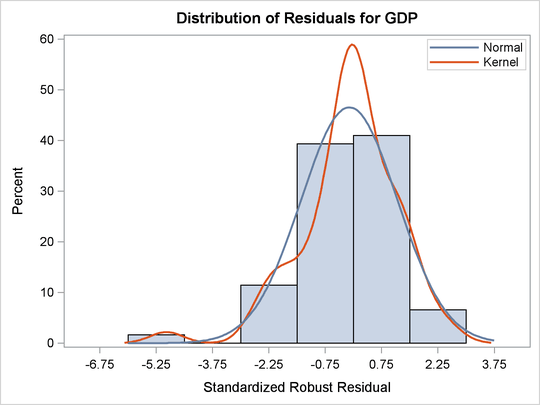 Robust regression and outlier detection techniques have considerable applications to econometrics. The following example from Zaman, Rousseeuw, and Orhan (2001) shows how these techniques substantially improve the ordinary least squares (OLS) results for the growth study of De Long and Summers. De Long and Summers (1991) studied the national growth of 61 countries from 1960 to 1985 by using OLS with the following data set growth. where the response variable is the growth in gross domestic product per worker (GDP) and the regressors are labor force growth (LFG), relative GDP gap (GAP), equipment investment (EQP), and nonequipment investment (NEQ). 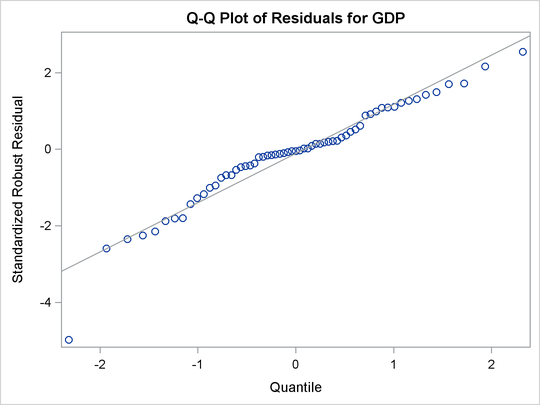 The OLS analysis shown in Output 80.3.1 indicates that GAP and EQP have a significant influence on GDP at the 5% level. The following statements invoke the ROBUSTREG procedure with the default M estimation. Output 80.3.2 displays model information and summary statistics for variables in the model. Output 80.3.3 displays the M estimates. Besides GAP and EQP, the robust analysis also indicates that NEQ is significant. 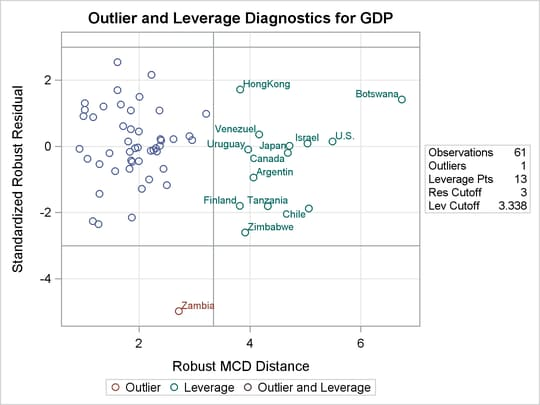 This new finding is explained by Output 80.3.4, which shows that Zambia, the 60th country in the data, is an outlier. Output 80.3.4 also identifies leverage points based on the robust MCD distances; however, there are no serious high-leverage points in this data set. Output 80.3.5 displays robust versions of goodness-of-fit statistics for the model. The PLOTS=ALL option generates four diagnostic plots. 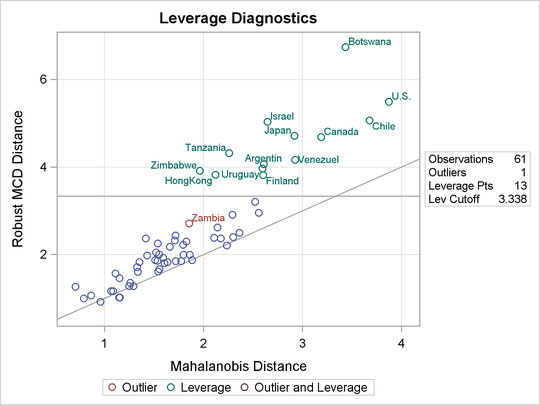 Output 80.3.6 and Output 80.3.7 are for outlier and leverage-point diagnostics. Output 80.3.8 and Output 80.3.9 are a histogram and a Q-Q plot of the standardized robust residuals, respectively. The following statements invoke the ROBUSTREG procedure with LTS estimation, which was used by Zaman, Rousseeuw, and Orhan (2001). The results are consistent with those of M estimation. Output 80.3.10 displays the LTS estimates and the LTS R Square. Output 80.3.11 displays outlier and leverage-point diagnostics based on the LTS estimates and the robust MCD distances. Output 80.3.12 displays the final weighted least squares estimates, which are identical to those reported in Zaman, Rousseeuw, and Orhan (2001).